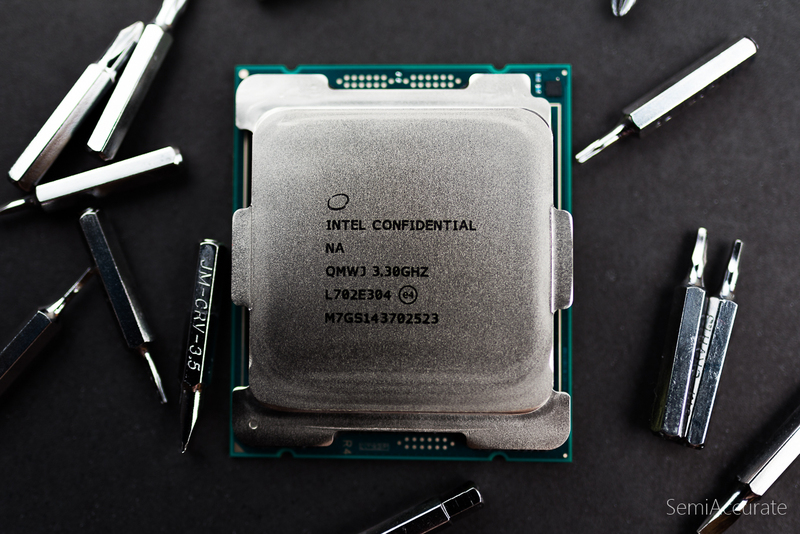 In this article we’ll be reviewing Intel’s top desktop CPU: the Core i9-7900X. Although Intel has announced new high-end parts that are slated to launch later this year the i9-7900X is still Intel’s fastest desktop CPU to date. As for its basic specifications the Core i9-7900X is a 10 core chip with Hyperthreading for a total of 20 threads visible to the OS. It’s base clockspeed is 3.3 Ghz and with Intel’s Turbo Boost 2 technology it can reach a maximum clockspeed of 4.3 Ghz on a single core. 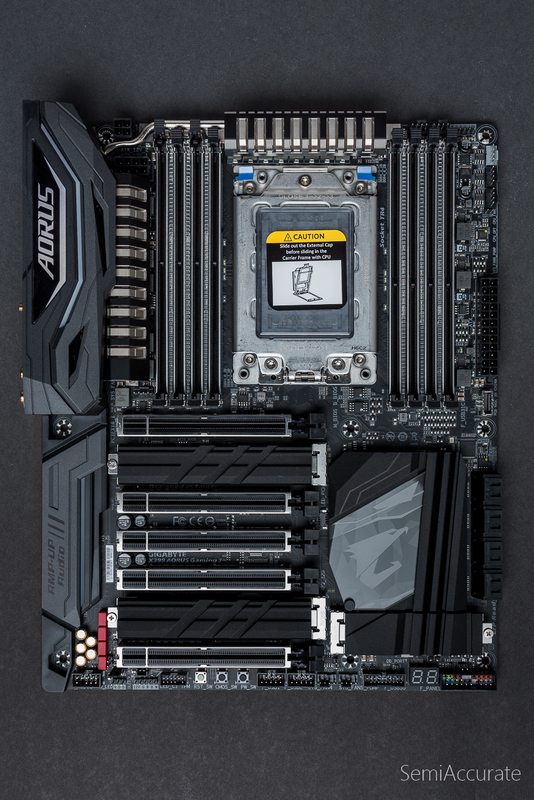 With our test motherboard, Gigabyte’s X299 AORUS Gaming 9, Intel’s Turbo Boost Max Technology 3.0 enabled by default. 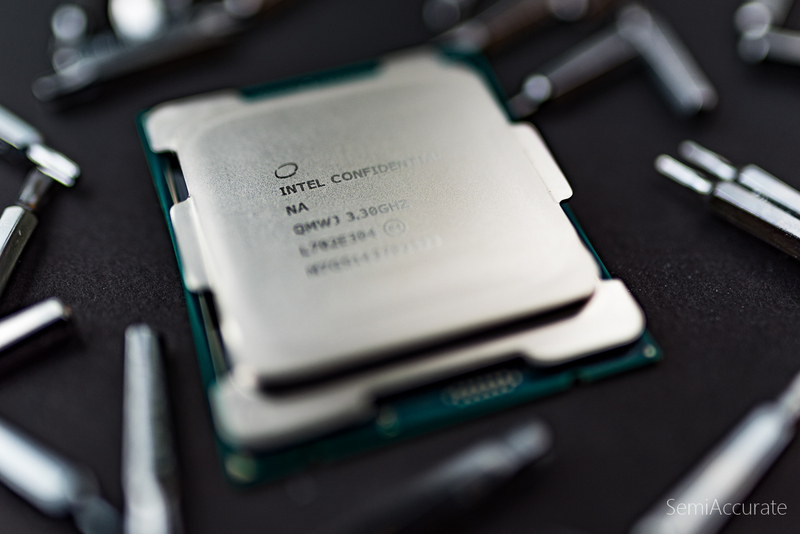 This feature allows our i9-7900X to clock its best core even higher, up to 4.5 Ghz. With the Core i9-7900X Intel has created a high core count version of Skylake with no compromises. This is a big change from Intel’s older HEDT parts which often traded ever higher core counts for lower singlethreaded performance. With TBMT 3.0 Intel is removing this traditional handicap and offering up a chip that is at least no worse than cheaper offerings in lightly threaded apps. In addition to a reasonable base clock speed and excellent turbo states Intel’s Core i9-7900X brings a sizable 13.75 MB L3 cache and support for AVX-512 to the table. It remains to be seen what impact, if any, this large cache and cutting edge instruction set will have on the performance of the i9-7900X. Both features fall into the nice-to-have category if you’re planning on keeping your PC for a few years. On the memory side of things the Core i9-7900X is a true HEDT CPU with four memory channels rated for speeds of up to DDR4-2666Mhz at one DIMM per channel. In our testing we had no trouble enabling the AMP profile on our memory kit and the i9-7900X gave us no trouble running all 32 GBs of DDR4 at 3200 Mhz. Unlike its Ryzen Threadripper competitors the Core i9-7900X does not support the use of ECC memory. This is a feature that Intel is still reserving for its Xeon chips. Additionally the i9-7900X has a memory cap of 128 GBs compared to Threadripper’s support for up to 2 TBs of memory. This is a rather academic difference because the densest desktop DDR4 memory kits are 16 GBs per DIMM. More to the point filling all four memory channels at 2 DIMMs per channel for a total of 128 GBs of RAM will set you back about $1500. At that point your memory compliment will be more valuable that your CPU. With all of that out of that out of the way I want take a moment to clearly state that the X299 platform is awesome. I have yet to throw something at it that it can’t handle. I’ve used it as test bed for CPU reviews, our recent RX Vega testing, and now I have it running 24/7 as part of mining rig. With mainstream platforms like AMD’s Ryzen 7 offerings or Intel’s X270, I’ve found myself running out of PCI-E lanes when building systems with multiple graphics cards, NVMe SSDs, and PCI-E WiFi cards. With X299 that’s just not an issue because of how flexible and extendable this platform is. Credit where credit is due, you can make this same comment about AMD’s competing X399 HEDT platform as well. One of the caveats to buying into Intel’s X299 platform is the 44 PCI-E lane cap. Again AMD’s competing X399 platform supports up to 64 PCI-E lanes where the first 4 four are reserved for the chipset. Thus its important to think about exactly what PCI-E devices you want in your workstation and how many lanes they’re going to need while you’re considering if the i9-7900X is the right chip for you. In practice though the difference in PCI-E lane count hasn’t caused any issues or created any challenges in my testing. Both platforms have more PCI-E lanes than you need for two GPUs (32 lanes) and two NVMe drives (8 lanes) and a PCI-E WiFi card (1 lane). If you have a more rigorous configuration than this in mind it’s worth penciling out how many lanes you’re planning on using. Let’s start by comparing the performance of Intel’s top chip to the next chip down in the product stack, the Core i7-7820X, an 8 core chip with the same TBMT 3.0 single core clock state of 4.5 Ghz. Given that we know these two chips share the same top single core clock-speeds and die its unsurprising to see that they offer essentially the same performance in our single-threaded testing. In our multithreaded tests the i9-7900X starts to step away from the i7-7820X by up to 27 percent. Again there’s a 2 core, 4 thread gap between these two chips so the difference isn’t that surprising. In our gaming tests these two chips offer the same performance. Interestingly the i9-7900X has an advantage over the i7-7820X in our YouTube 4k power consumption test. We were able to replicate this result over multiple runs and unable to troubleshoot its cause during our testing session. Our best guess is that this is some kind of firmware issue. At the time of testing the i7-7820X is still a very new chip and given that it uses the same physical die as the i9-7900X there’s no technical reason why we should be seeing this difference. I’m betting that this issue will get worked out with a BIOS update. Looking at our performance per watt numbers we can see that in general the i9-7900X is able to show off better efficiency than the i7-7820X indicating that it’s a better bin on the frequency/voltage curve in addition to having more cores enabled. At the $1000 price point Intel’s Core i9-7900X is lined up directly to take on AMD’s 16 core, 32 thread Ryzen Threadripper 1950X. Compared to Ryzen Threadripper 1950X we can see that the i9-7900X offers a significant advantage in our single threaded testing. The reverse occurs when we move to our multithreaded tests where AMD’s Threadripper pulls ahead. In gaming Intel and AMD are more or less evenly matched. 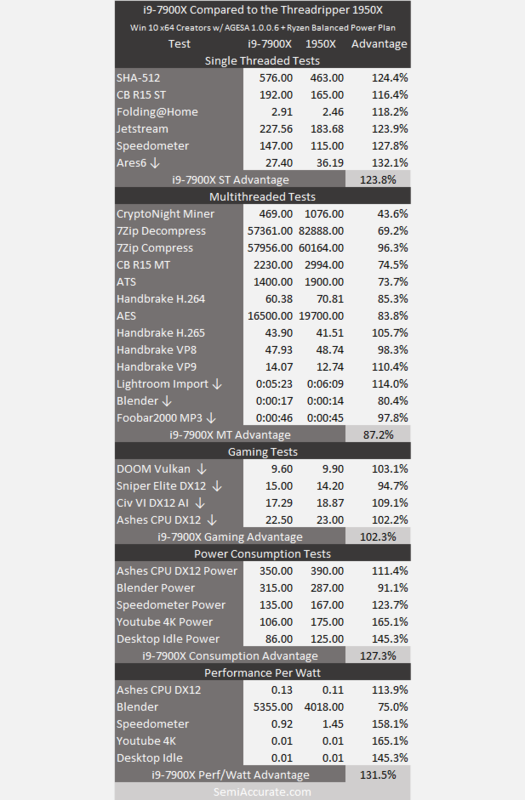 Moving to raw power consumption Intel holds a clear advantage in idle and lightly threaded scenarios while AMD’s Threadripper draws less power in our Blender test. Our performance per watt numbers mirror the results of our raw power consumption testing. As we said in our Ryzen Threadripper 1950X review the choice between these two chips basically comes down to whether you prioritize lightly threaded performance or multi-threaded performance. If you want the best lightly threaded performance coupled with multithreaded performance that is still excellent then the Core i9-7900X is the chip for you. On the other hand if your goal is to build the best rendering box with single threaded performance that’s still top-tier then AMD’s Threadripper is a better choice. Lets even the odds a little bit and match the i9-7900X up against AMD 12 core, 24 thread Threadripper chip the 1920X. The i9-7900X maintains its lead in single threaded performance while more or less matching AMD’s Threadripper 1920X in our multithreaded testing. Again gaming performance is similar between all of these HEDT chips. 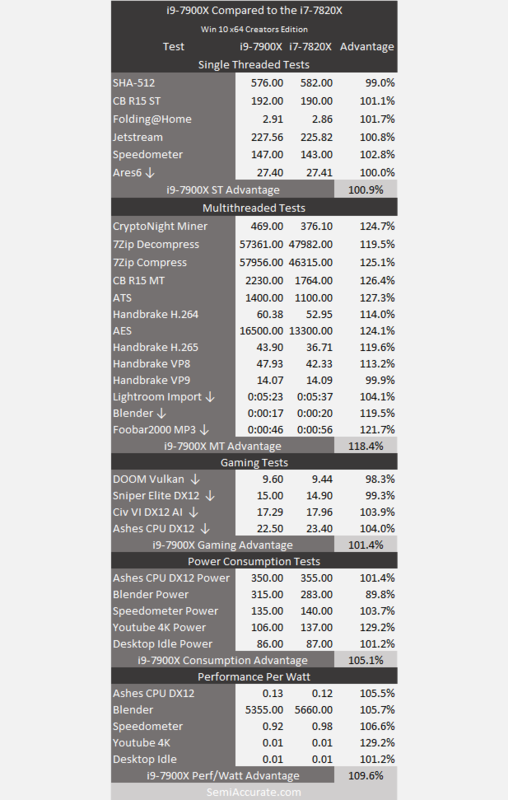 Just as we saw with the 1950X the i9-7900X draws less power and offers better performance per watt except in our Blender workload.